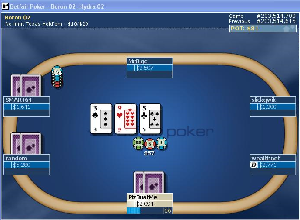 Betfair Poker recently moved to the iPoker Network, using the playtech software. They are on the iPoker2 tier to be specific. As with all the iPoker rooms, USA Players are not allowed to play here. Neither are players from Australia. Their lowest deposit minimum is €7 (or £5) by Paypal and €15 Euros, or £10 Pounds by Skrill. All the usual payment methods are available for players to deposit to Betfair. Aside from the poker room, Betfair have the largest sports betting exchanges in the world. They also have an online casino, and online games offering. Betfair have been in business for over 10 years, and just recently they were floated on the London stock exchange, so they are fairly solid and secure. They have a number of gambling licences, the poker room being licenced in Malta. They have a long list of payment methods available including the most popular ones such as Visa and MasterCard, debit cards, Laser card, Paypal, Skrill, Neteller and Bank Transfer. Deposits can be as low as 5 pounds or 7 euros if you are using Skrill. Most other methods start at £10 pounds or 15 euros. You can hold your account in Euros, Dollars or Sterling. The lowest stakes available are $0.02 / $0.04. The Playtech software used by the iPoker network poker rooms has been upgraded repeatedly over the last few years. And it is fair to say that it has improved enormously. Even so, there are still some reported bugs in the system, and the occasional glitch can be annoying. The network has a lot of players on at most times, so there never is a problem getting a game, especially at the lower stakes. There are a lot of recreational players, possibly from the various sportsbooks that are using the network, so the play can be loose and rather ‘fishy’. That is, suckouts and badbeats should be exxpected due to the nature of the players on this network. Taking a long view, loose players can be better for your profitability. If you are the type of player that can handle the swings and variance that is involved in playing against players who will go to the river with just about any two cards, then there is a reasonable chance of profitability here for you. If on the other hand, you are the type of player that prefers a purer form of the game, you would be best advised to stay away from the lower stakes tables here. For the fishy type of player, you are guaranteed to get some action at this site. Other good products from the Betfair site include their betting exchange, which is the biggest online exchange – in fact it was the first real exchange – and you can expect to get real value on any of your bets here. The minimum amount you can bet is £2.00 though there are ways around that if you are a relatively small stakes player. Following on from the betting exchange model, where in effect you are betting on sports against other punters, Betfair developed their exchange games platform. This games exchange allows you to bet popular casino games where you can be the player or the house. If you fancy taking a slice of the easy profits that casinos get, you could lay all the blackjack bets on a simulated table of four blackjack hands. All the games and the hands are played out automatically, all you have to do is decide if you want to bet on the player or the house. You can do both; betting on say player A to win and Player B to lose. You can bet at any point in the hand, though the odds will have changed to reflect the cards that are shown at that point. This exchange games product is one of the better ones that Betfair have come up with since starting the original betting exchange. The poker room and the sportsbook are really the normal offering that you can get from most reputable online gambling sites now. The games suite though is attractive in that you are not limited to being on the receiving end of the bad run of cards that always come up on the blackjack table from time to time, and instead you can be the dealer and take advantage of those terrible runs. The minimum bet here is also £2.00 but again you can get that lower if you know what you are doing. There is also a traditional casino offering and a games platform that you can try out. As a new poker player you can expect to get offers from Betfair to try these different gambling products and usually the deals you get will be worth taking up, hopefully in the form of no lose bets, or cashback on any losses you do sustain.